Three little letters... Hopefully this will become 1.0! (Three more little characters). There are no new features I want to add so the only looking for major bugs and translations. And about translations... I made a script to import the translations provided in the Gnome version. This was mostly done to stop duplicate work of people not knowing about the Gnome version. (Note to self: I need to get the translations pushed the other way so the Gnomers don't waste too much time too). But I want more! Send me your translations! Now! OK, not right now but very soon! 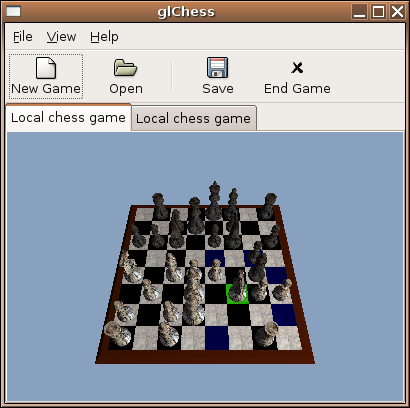 The Gnome and sf.net codebases now match for .py and .glade files. 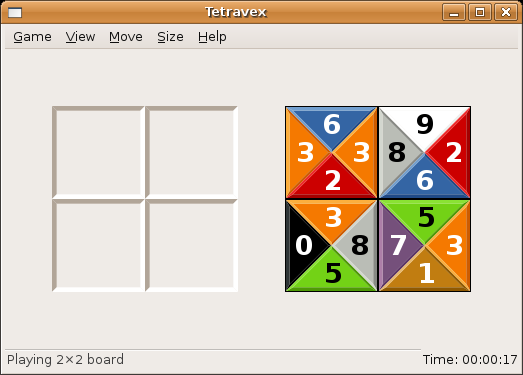 This means after 1.0 I will only work on the Gnome version and periodically backport the changes. These changes are in the Gnome Games CVS repository (I think some made it into 2.17.1). So hopefully at 1.0 the Gnome and Sourceforge version will be synchronised. 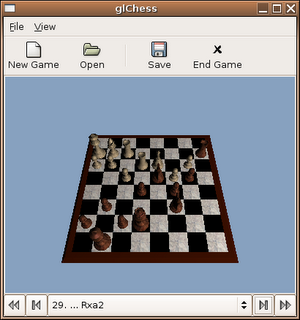 At that point I'll only be making changes to the Gnome version - I will consider backporting at milestones to make glChess 1.1, 1.2 etc if users want it. glChess release candidate 2 is all ready to go... Except there seems to be a bug in dpkg-dev. So you'll just have to wait. It fixes a 64 bit bug, a 3D bug and adds fullscreen mode. 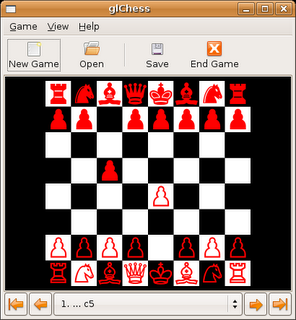 systems (Bug found by Michal Bentkowski). selecting outside board in 3D mode (Bug found by Michal Bentkowski). o Moved glade files to top-level directory. o Make symbolic link so Glade can find the icon when not installed. o Got rid of bogus GtkWarning from GtkComboBox on startup. There's a new project called Nouveau to make some open-source nVidia drivers for DRI. This sounds great as DRI seems to fit in well where nVidia just made up new architecture everywhere. From the Nouveau web-page it sounds like it's not too hard to write drivers - all you have to do is convert OpenGL calls to appropriate format for the hardware. All the OpenGL state machine work is done for you by Mesa (and is shared between all the DRI drivers so bugs get fixed once only). As seen on Planet Gnome - Gnome could really get stylish if this becomes mainstream. Hmm... I want to put the 'Translate This Application...' button onto glChess as seen in Ubuntu applications. After digging around in the source code of a bunch of applications (there seems to be an excessive amount of layers in a lot of applications...) I found that there is a library for launchpad (the Ubuntu bug/translation etc webtool) support. 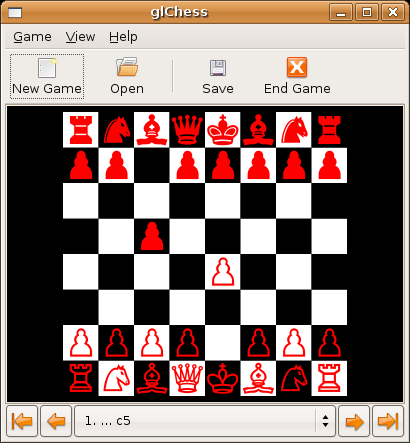 So the question is does anyone know an easy way of integrating this into a PyGTK+ application like glChess? 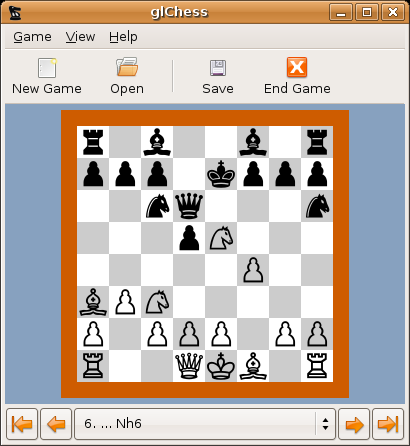 It seems most of the Gnome apps don't use glade for their main window so I'm not sure if I can do this easily (I want all the UI in glade files). 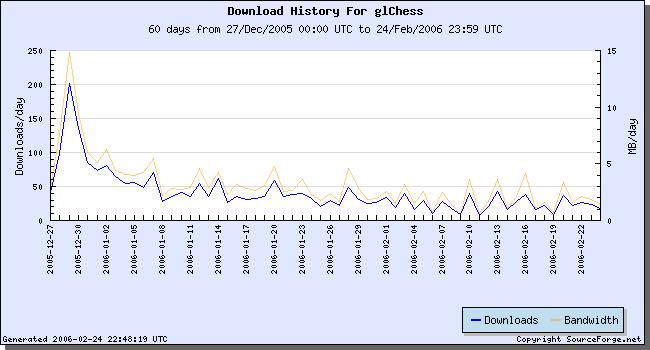 It's a glChess New Years? Remove link (not a permalink) and image added (you can just see the peak on the left). Thanks Joel! 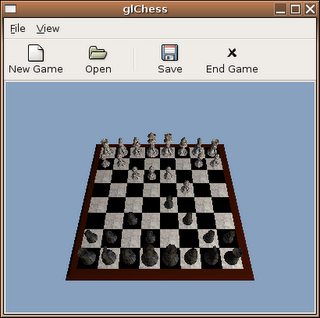 Finally got glChess 0.9.0 out the door! So it's up there on the website as a source and .deb package. I had to end up making a .deb package for PyGtkGLExt. Hopefully Debian/Ubuntu will take the work off my plate in the future! So one big new features is good AI support - I have it working with four AIs and you can load and save games without the AIs getting confused. It turned out most AIs don't seem to have a save function so I just inform them on load what the previous moves were. But there's no network support now. I plan to get it back in later.